Andrew Lerner looks like he just stepped off the pages of GQ. At 29, six feet tall, 180 pounds and hazel eyes, he oozes subtle masculinity and innate innocence, bearing the attributes of an NFL tight end. Picture Superman and Clark Kent or Butch Cassidy and the Sundance Kid. But beneath that demure demeanor lies his true countenance, horse trainer, body and soul. It was not a matter of if, but when it would happen. “I created a couple of businesses that fortunately did well, and that put me in a position to buy some horses,” Lerner said. “I sent them to trainer Mike Pender with the caveat that I wanted to learn to train. “I started a company with a friend of mine in 2012 and we did well; I sold half of it, not for a fortune, but for enough where I was able to buy a horse named Be a Lady and give it to Pender. “That’s how it all began. She’s still racing. 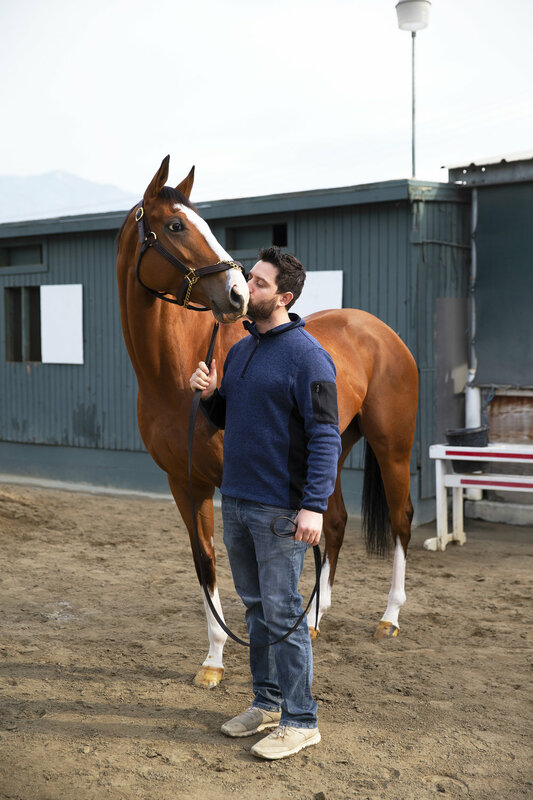 “I told Mike I wanted to learn how to train, came out every morning at 4:30, shadowed his grooms and hot walkers for about a year and a half, then decided I wanted to learn how to ride, not at the track but somewhere else, just to get an idea of what the jocks and exercise riders were talking about when they got off a horse and told us how it went. “I wanted to understand first-hand what they were explaining, more than just hearing their words. After that, it took me about six months to get my trainer’s license in March of last year. Lerner came to Pender’s barn every morning, not with a chip on his shoulder but a thirst for knowledge. Thus, Pender readily recognized that Lerner would triumph against the odds. His acuity was ever present. “He won a race with the first horse we claimed together, and we were off and running,” said Pender, 52, a Los Angeles native whose major stakes winners in a career approaching 15 years include Jeranimo and Ultimate Eagle. “When he told me he wanted to train, I asked why he would do such a crazy thing, and he was emphatic. He said he wanted to, and I knew how he felt because I had been in his shoes at one time. “I told him he was going to fail more than he’d succeed and tried to talk him out of it, but he stood his ground. Even after I told him the only way to succeed was through hard work and spending a lot of money—some of it coming out of his own pocket when owners don’t pay and walk away leaving you high and dry with a $10,000 feed bill—he remained firm. “He gave the right answers to all my questions, but most importantly, he showed up every morning. I’ve had a lot of guys walk through my doors saying they want to become trainers, and I feel a responsibility for them to achieve that goal, because it’s trainers who bring in new owners.